Vi hälsar alla välkomna att läsa och inspireras av vår sida med allt om fjällvandring i Norge och Sverige. Welcome to Tilltopps. 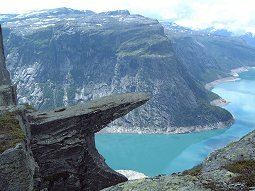 We hope you'll get inspired of our hiking tours in Sweden and Norway and that you'll find some interesting articles to read. Now you get the actual weather report from the heart of Jotunheimen. Just click on a red spot on the map below and you'll find the weather from today and of course the next coming days. What can be better than a hotdog after a hard walk? Use a thermos with hotdogs and make everyone jealous when they are eating cold sandwiches! The hike starts from the old hut Turtagrö, which was destroyed in a fire a year ago. You will pass the climbing hut, Tindeklubbhytta, on the way. Continue over the glacier Skagastölsbreen and from there it isn't far to Skagastölsbu. The views are great with Storen and Midtmaradalen just nearby. 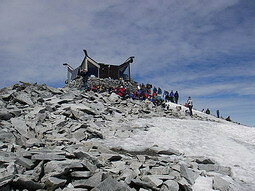 Storen or Store Skagastölstind is Norways third highest mountain. You'll need climbing experience to get to the peak. Place no. 66: Austre Nautgardstinden. The height on the peak is: 2194 m.
We have plans to hike in New Zeeland and in the Alps in the future. If you have information that you would like to chare with us, for example peaks to climb, routes to hike and so on, don't hesitate and send us an email. This is highly appreciated. When it comes to cooking, it would be interesting to know what you eat on your hikes. On our trips the last years the food hasn't been varied a lot. Dried food is something we would like to learn more about. You can count on more reports about this in the future. This year we visited Trolltunga in western parts of Hardangervidda and the glacier Folgefonna. We strongly recommend that you take a closer look of our guide to Jotunheimen. Here you'll find most of the routes in the national park with descriptions and our personal comments. You must send an electronic postcard from Till Topps to someone you know. It's quite easy and you can choose any picture you like from our travel stories. Right now you can read our stories about the hikes we have done since 1996 and of course take a look at the pictures. 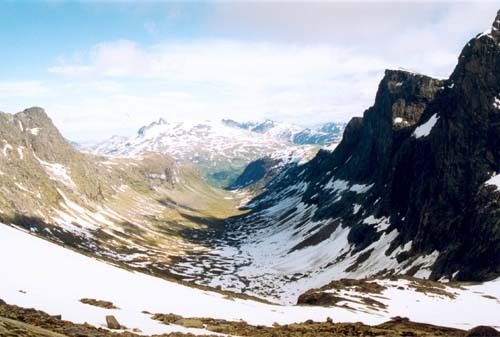 From this section you also reach the guide to Jotunheimen and the postcard function. Is there anything you would like to know about hiking? Just read this page with questions from our readers and answers from us. If you are lucky you might find what you are looking for. Glacier hiking gives you a new dimension of your outdoor activities. But before you explore the ice read our introduction to the glacier world. Here you'll find a lot about equipment, knots and security. We will teach you how to make dried forcemeat sauce. Just read our step by step course and try it yourself. According to other people it's a great success. Every time when our hike starts, questions like this comes up: Who took the tent and the camera? You don't have to worry anymore, just read our equipment pages and have a look at the checklists.